To transfer a registration to a vehicle the following documents are usually required. The Vehicle Registration Certificate (V5C), commonly known as the 'logbook' is a certificate that is issued when a vehicle is registered with the DVLA. The V5C is sent to the registered keeper (the person responsible for registering and taxing the vehicle). 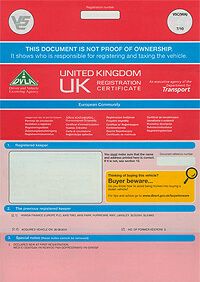 If you are purchasing a registration number from us and have only just purchased the vehicle, and are still awaiting a new registration certificate to arrive in your name and address (or if you have lost your Vehicle Registration Certificate), we may ask you to send us the New Keeper Supplement (V5C/2) along with DVLA form V62 (Application for a duplicate Registration Document).